1.40 miles south of Echo Summit we encounter this foot Bridge across the creek feeding Benwood Meadow, off to the Left. Trail difficulty increases after the bridge. 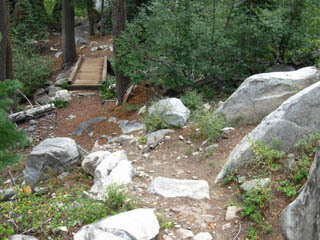 Soft but rocky trail approaching foot bridge. 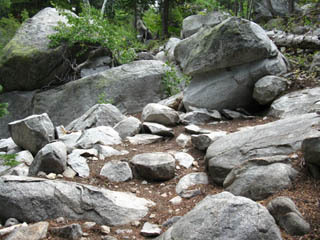 Though the terrain provides an excellent soft yet firm forest trail surface, the forest is a just a thin cover upon great granite outcroppings. 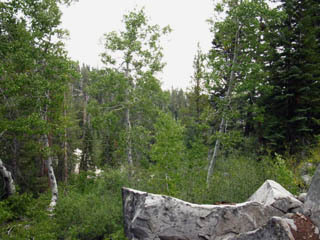 Aspens grow thickly along the damp drainages. Looking across the South end of Lake Tahoe. We are on the Southwestern rim looking over at the Carson Range on the Southeastern rim. There are very few views of Lake Tahoe from Echo Summit to the Carson Gap. This is one of them. Mostly we wind around through deep forest and sheer rock, suddenly emerging onto an crack in the terrain or forest cover opening up quick views into and across the surrounding terrain every now and again. 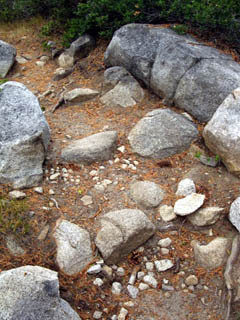 Though the trailbed is soft from thick forest floor liter, it is still the rock that characterizes the trail. And it is the Massive rock formations that determine the trail route. 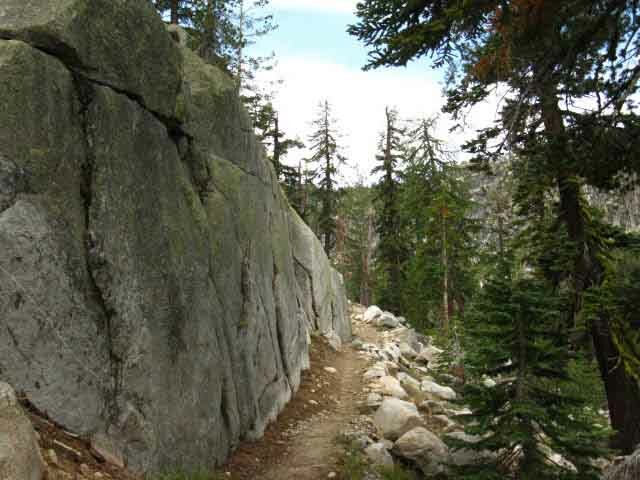 The Pacific Crest - Tahoe to Yosemite trail works its way South around a great granite wall. This is a very nice trail thorough densely forested granite terrain here. 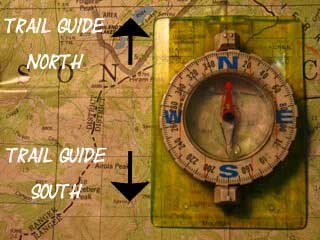 Our direction above is Southwest by the compass moving into the ravine running Southwest up to the crest of Peak 8905. This explains our lack of views climbing this part of the trail. We are pointed Southwest climbing in a deep granite ravine. Our views East, the direction of Christmas Valley, and Northeast at Tahoe itself will open up as we approach an excellent break spot located in a gap a bit more that halfway up our climb. 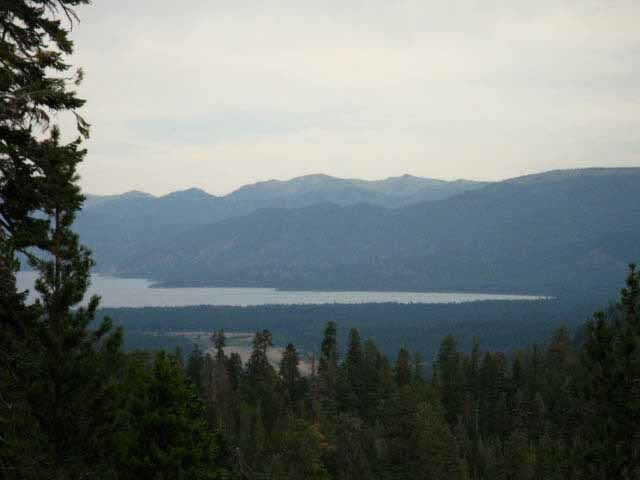 This break spot has an expansive view overlooking Christmas Valley and the South end of the Tahoe Basin. We'll take a break there to take it all in. Turning around to look to our Northwest we see the top of the Sierra ridge rising to the Southwest of Echo Summit dropping down to Echo Summit. 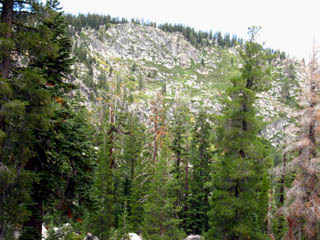 That ridge marks the Western extent of the Tahoe Drainage above Christmas Valley. Our trail South (behind us) arcs Southeast following the Tahoe Rim along the Southwestern edge of the Basin's drainage towards our first goal of Showers Lake. 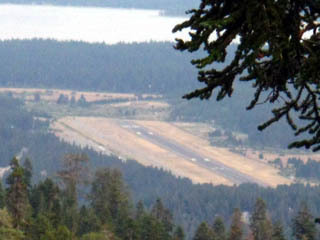 The South Lake Tahoe Airport with Lake Tahoe in the background looking Northeast through a break in forest cover. Check out the long view to the Northeast, at Stateline in South Lake Tahoe. 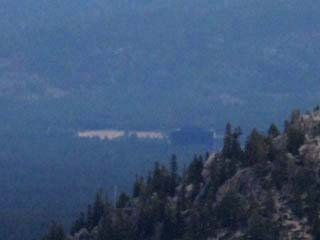 It looks like Harvey's Casino, Stateline, from our position on the far Southwestern edge of the Tahoe Rim. 1.4 miles South from Echo Summit. 1.48 miles to high point of trail. 5.4 miles South to Showers Lake. 10.6 miles South to Carson Pass. Hitting the footbridge marks the point where the trail difficulty transitions from Intermediate difficulty 3, the lowest level of intermediate difficulty, to Intermediate difficulty 1, the hardest of the three levels of intermediate difficulty. From the footbridge to the Sayles Canyon junction we will be going constantly up and down, as if on a washboard or roller coaster tilted mostly upward for 1383 feet over almost three miles. Our first target is the gap with a fantastic overlook of the Tahoe Basin about halfway up our climb. Once we get over the highpoint of this section of trail across Peak 8905 our descending trail relaxes to Easy 1, South through the Sayles and Schneider trail junctions to Showers Lake. Easy 1 is the most difficult degree of easy level trail. Have a backpacking issue to relate? 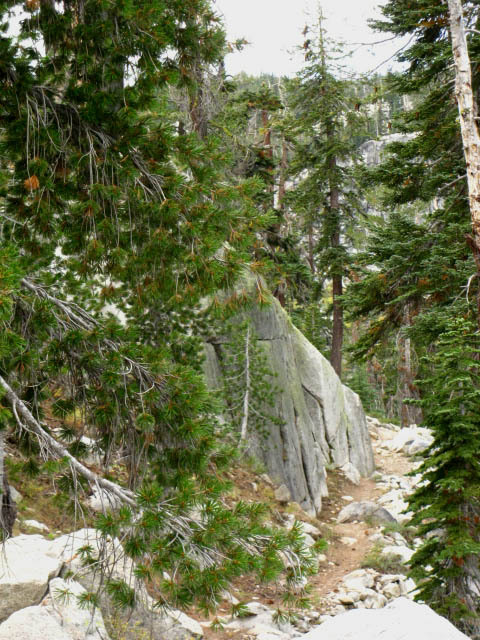 On the TRAILS Forum you can browse the locations and add your experiences, comments, questions (or pictures and videos) about hiking South out of the Echo Summit Trail Head. The TOPICS Forum deals with backpacking issues.